With the destruction of natural habitats on the rise, local critters are looking for new places to call home. Here, Jacqueline Maya digs up the dirt on how to design a wildlife-friendly garden that can be enjoyed by your family and furry friends alike. 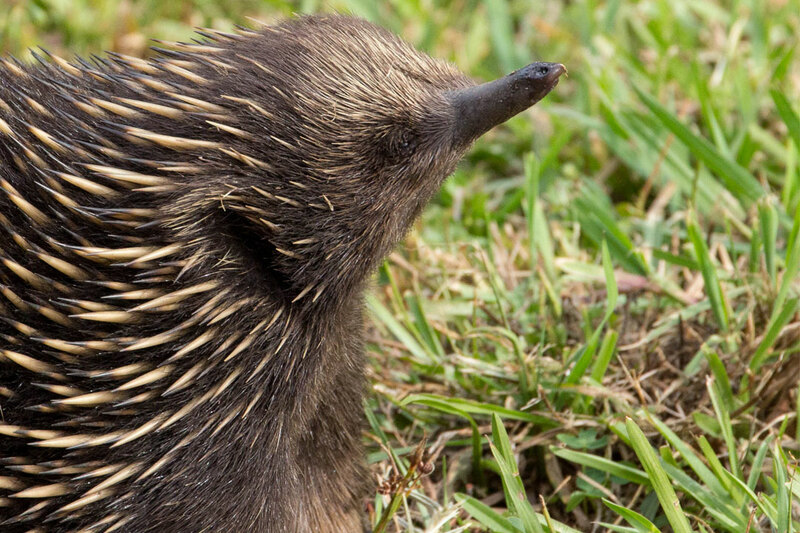 Whether you live on an expansive rural property or a small city block, there are a whole range of ways to make your backyard a more inviting space for Australian critters. 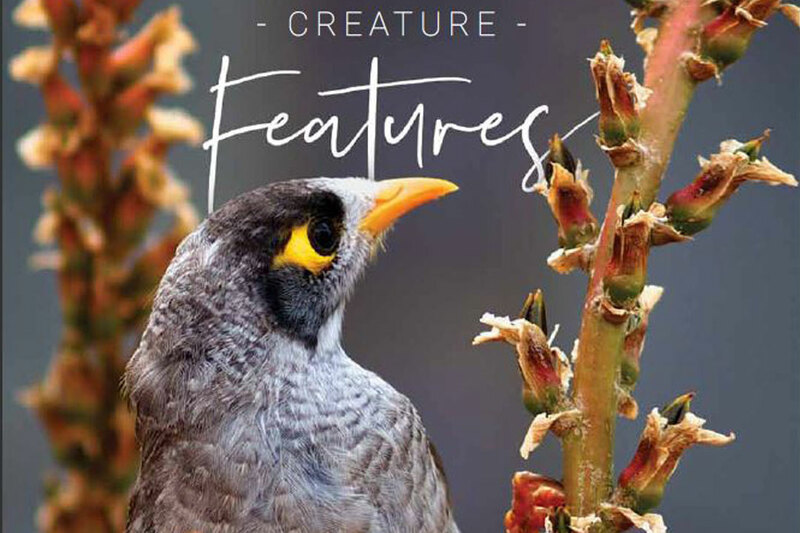 Western Australia Pool + Outdoor Design investigates the personal and environmental benefits of encouraging local wildlife into your outdoor space, and provides a guide to establishing a thriving garden. Whether you live on an expansive rural property or a small city block, there are a whole range of ways to make your backyard a more inviting space for Australian critters. 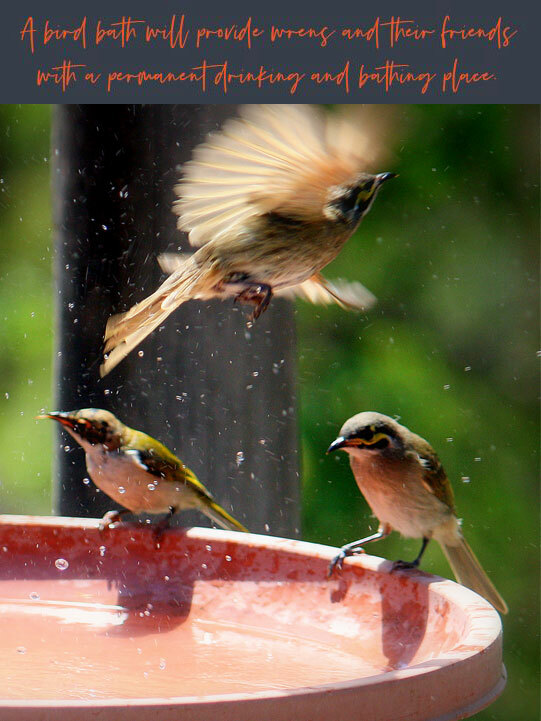 Melbourne Pool + Outdoor Design investigates the personal and environmental benefits of encouraging local wildlife into your outdoor space, and provides a guide to establishing a thriving garden. When people talk about natural habitats for animals, they usually think of the countryside. 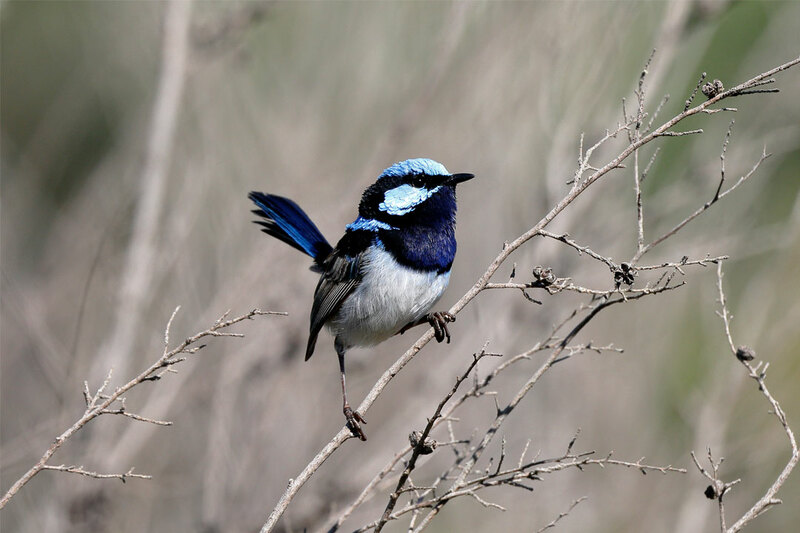 However, with Australia’s native wildlife population suffering from increasing loss of habitat, more birds, mammals and reptiles are moving into urban areas in search of a suitable environment. Luckily, residential gardens can provide a crucial refuge for wildlife, especially since they are often free from pesticides, fungicides and other nasty substances. While one wildlife-friendly garden may seem insignificant, the cumulative effect of many can help to rebalance the ecosystem of your area. Furthermore, you and your plants will enjoy the benefits of natural pest control and cross-pollination for increased fruit and seed production! The first step to creating a wildlife-friendly garden is to plan your landscaping. It’s vital that you choose a design that is suitable for your location, climate and lifestyle. In order for your biodiverse backyard to flourish, it will require regular attention, so it’s important that your chosen design is one that you’ll realistically be able to maintain. Backyards with indigenous and native plants usually need less maintenance than gardens with exotic species. However, if you’re planning a total garden transformation, it’s best to engage a qualified landscape designer to help develop an overall plan. Soil selection can make or break your garden. There are three main soil types that are commonly used in backyards – clay, loam and sand. Good-quality clay soil will stay moist and easily form together in a small ball; loam soil will form a rough ball and appear crumbly, while sand soil is quite coarse and won’t stay together at all. Your soil choice will depend on price, availability and the types of plants you wish to grow, all of which should be discussed with a professional landscaper. In order for plants to thrive, they’ll require plenty of loose soil so that the roots can continue to grow deeper into the ground. This is vital in the early planting stages. There’s really not much to mulch. Mulching your garden has significant benefits, as it helps to maintain soil moisture while reducing the need for additional watering. It protects the soil from erosion, limits the growth of weeds, and provides shade for plants in the warmer months. Mulch also provides a generous amount of humus, which is formed from decaying plant or animal matter, and will improve the overall health of your soil. Mulch is best made from organic materials that are free from disease, such as a mixture of tree stems, leaf fall, and grass clippings. Investing in a home mulching machine is ideal if you want to turn all your pruning remnants into mulch. However, a cheaper alternative is to keep all of your garden clippings reasonably small and put them straight back onto the garden. Nothing needs to be wasted! Apply your mulch 7.5cm–10cm deep and away from plant stems to avoid root rot. While there are many benefits to mulching your garden, it is best used only as a temporary measure, and the mulch should be left to break down on its own over time. As with mulch, regularly composting and fertilising your garden will keep your plants happy. Put simply, the easiest way to distinguish between compost and fertiliser is that the former feeds the soil, while the latter feeds the plants. 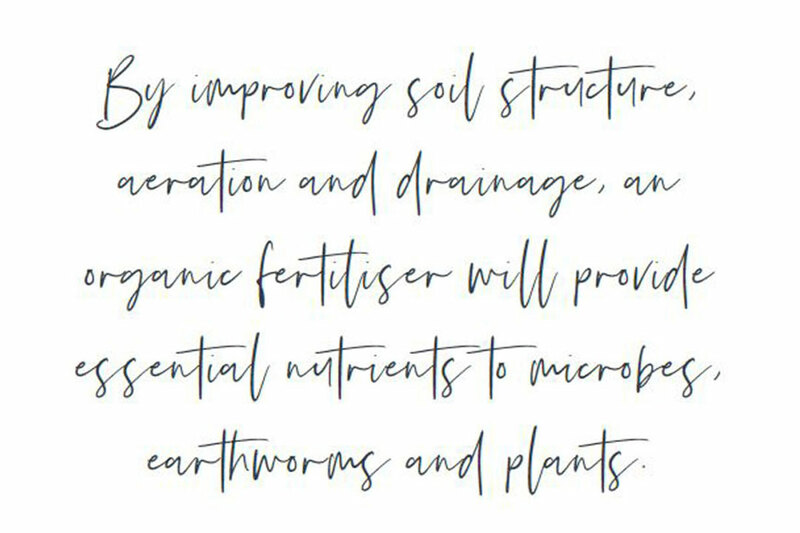 an organic fertiliser will provide essential nutrients to microbes, earthworms and plants. Recycling everyday household and garden waste – such as animal manures, kitchen scraps, pine bark, and sawdust – by using a compost bin or worm farm is an excellent eco-friendly way to promote healthy, life-giving soil. Healthy soil means healthy plants! Designing an outdoor area that encourages local biodiversity is an effective way to rebalance the natural ecosystem of your backyard. Most Western Australian councils will have a list of your locality’s native plants, and in most cases will even be able to direct you to the nearest native nursery. Determining which native plants to use in your backyard will largely depend on your location, as well as the types of wildlife you want to attract. However, for those wanting to create the ultimate home among the gum trees, you can’t go past selecting an Australian classic, such as a tall, mature eucalypt or wattle tree. Planting native trees, shrubs and grasses in dense clumps will provide your more vulnerable backyard critters with shelter and nesting sites, as well as protection from larger predators. Similarly, incorporating a hedge as a substitute for boundary fencing will provide a precious weather-resistant shelter. When established in the correct conditions, Australian plants generally require little watering after an initial soak. For easy access to fresh water, consider incorporating a rainwater tank into your backyard. Using rainwater will not only reduce your water use, but it will also make your plants sing. The benefits of creating a wildlife-friendly garden are plentiful. Planting shrubs such as Australian indigo, gold-dust wattle, sweet bursaria, wedge-leaf hopbush, and narrow-leaf bitter-pea will attract native insects that act as natural pest controllers. These insects will safely eliminate pests so you needn’t ever use harsh or abrasive chemicals, pesticides or herbicides, which can disrupt your garden’s ecology. 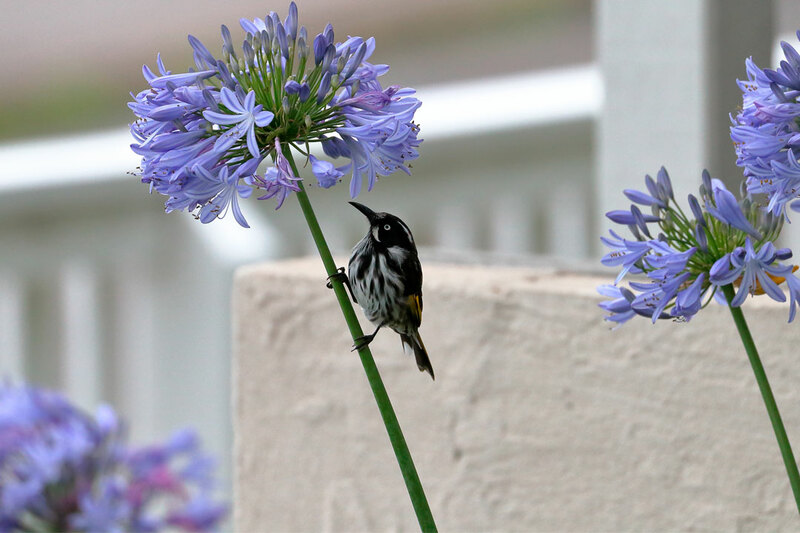 By including local flora into your garden, your backyard will eventually attract more helpful creatures like birds, microbats, lizards, frogs and even butterflies! While it’s easy to go totally wild over wildlife, it’s best to narrow down which species are easiest to attract and start with them first. Once you’ve seen some positive results, you can then decide which critter you’d like to introduce next. There’s no better feeling than sitting outside with a cup of tea and listening to the gentle sound of birds chirping in your backyard. As natural pest controllers, birds will keep nasty snails, slugs and insect larvae from taking over. If you want regular visits from our feathered friends, you’ll need to provide fresh food and clean water in safe places. 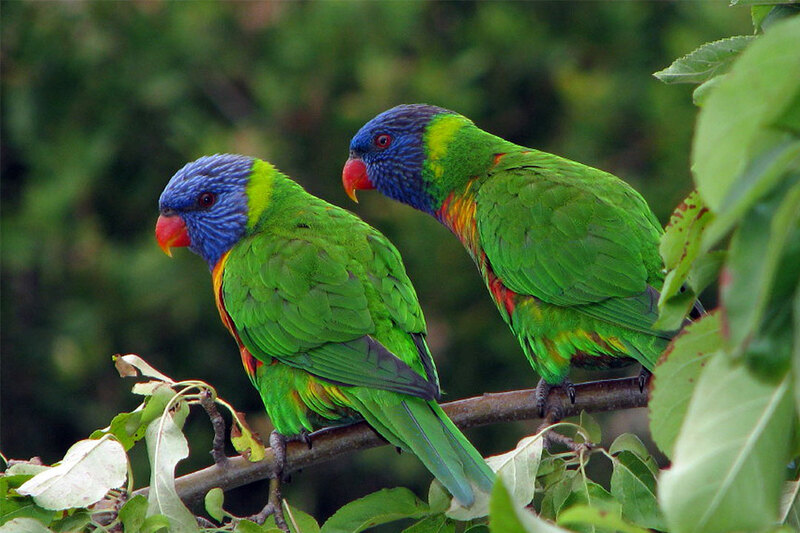 One of Australia’s favourites, the rainbow lorikeet is an iconic bird. 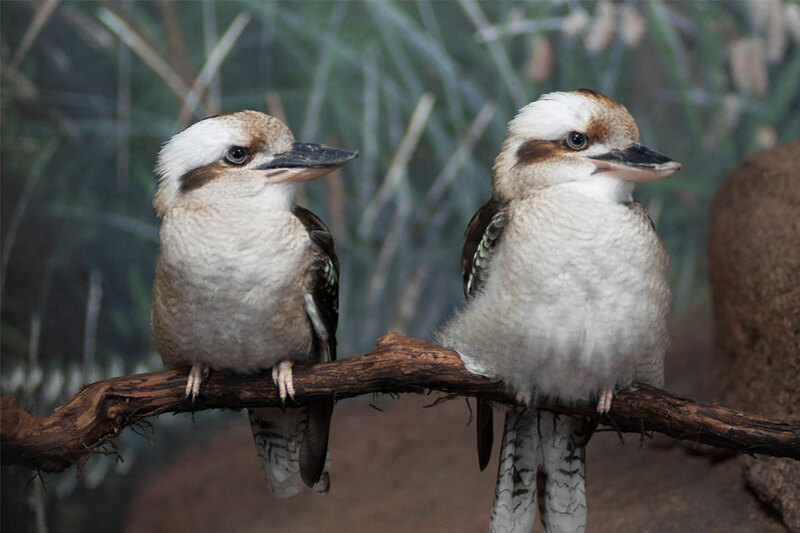 Establishing native tree varieties such as yellow gum, black she-oak, hickory wattle, and Australian blackwood will provide ample flowers and seeds for this lovable bird to eat. 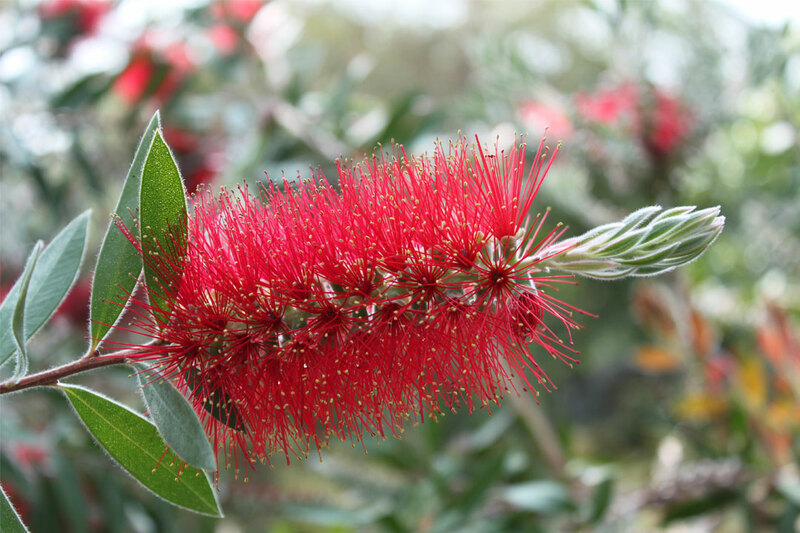 Shrubs such as a river bottlebrush and some species of tea tree also provide hearty seed helpings. Grasses and tufting plants such as tussock grass, rough speargrass, smooth flax-lily, and black-anther flax-lily are also highly recommended for their generous seed and berry yield, while grevilleas, banksia and callistemon are particularly popular among honeyeaters for their flowers and berries. Adding rest spots like nest boxes and shallow, elevated water dishes will allow your wildlife-friendly garden to really take flight! Nest boxes are not only ideal for birds; they’re also perfect for a variety of animals, such as microbats, wood ducks, and native bees, as well as the adorable ringtail possum. For a possum, a nest box is the next best thing to a natural tree hollow, which provides shelter and protection from predators. Nest boxes are readily available online, or if you feel like getting crafty, you can even build your own. Installing a nest box high within a tree will also reduce the likelihood of your possum friends taking up residence in your roof. Ringtail possums love to feast on many types of gum leaves, including eucalypt, lemon-scented and narrow-leaf peppermint. Possums have a reputation for ruining gardens, but they’re worth keeping around as pest controllers. To keep your veggie patch safe from their crafty paws, cover it with netting at night time, and try using bloodand- bone fertiliser or garlic spray to keep them at bay – they can’t stand the smell! No matter the critter, it’s vital that you regularly check and clean your nest boxes, but wait until breeding season is over – autumn is usually a good time. Give them a thorough clean with non-toxic cleaning products to remove the build-up of dirt, and top them up with fresh leaves and sawdust. 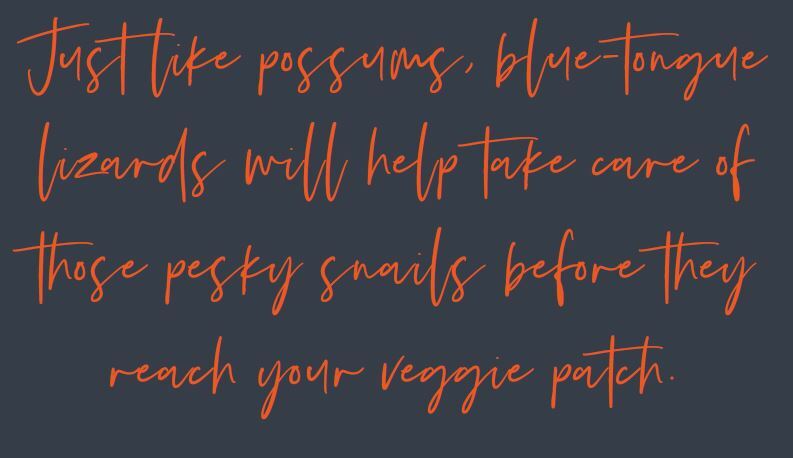 Just like possums, blue-tongue lizards will help take care of those pesky snails before they reach your veggie patch. 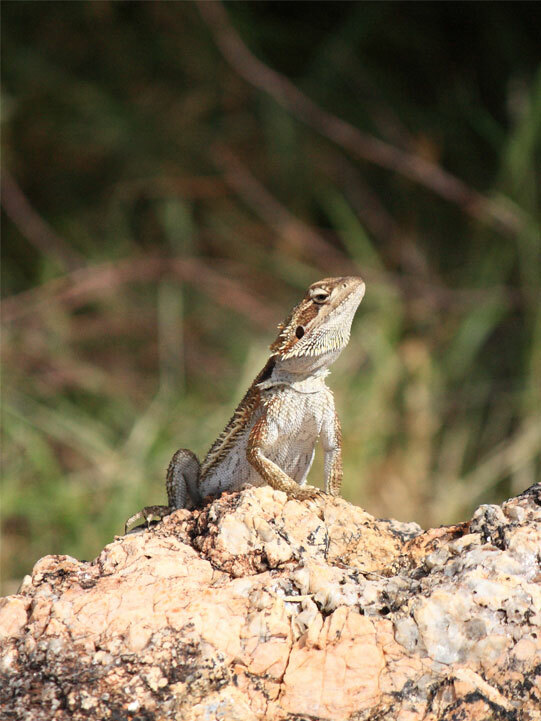 To create a lizard-friendly garden, provide some adequate shelter by using a combination of leaf litter, twigs, logs, and a pile of large elevated rocks, which are perfect for lounging in the sun. Terracotta pipes are also great places for lizards to hide. 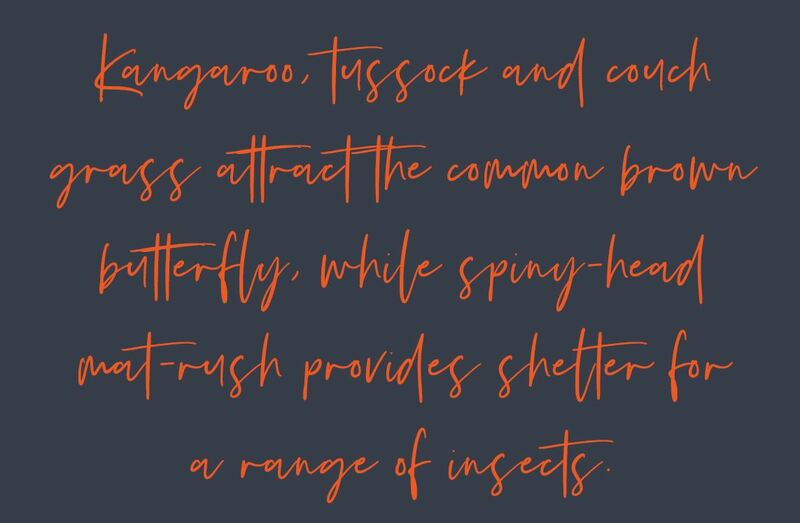 Wallaby, tussock and kangaroo grass all help to provide food and shelter for our lizard friends, as do spiny-head mat-rush and loose-flower rush. Lizards also love to nibble on varieties of saltbush for their delicious berries. Bee-lieve it or not, butterflies and bees are vital for sustaining our ecosystem. Incorporating native flora into your garden will attract the pollinating insects and birds that keep plants healthy and thriving. For increased pollination within your backyard, select a variety of different flowers that will bloom throughout the entire year. Bee larvae depend on the pollen that’s collected by their parents, so flowers are essential for increasing local bee populations. 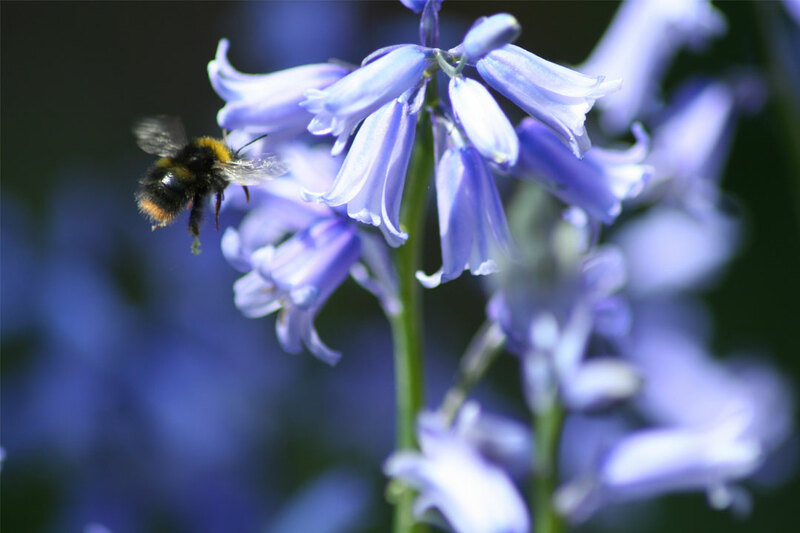 Wild flowers such as bluebells, shiny everlasting, clustered everlasting, and cut-leaf daisy will provide plenty of nectar for bees and butterflies alike. High-nectar shrubs like Australian indigo, sweet bursaria, and hop goodenia are also ideal. Kangaroo, tussock and couch grass attract the common brown butterfly, while spiny-head matrush provides shelter for a range of insects. In order for these plants to thrive, they should be established in a sunny, well-drained area in your backyard. (animals like spiders and worms that don’t have a spine). These types of animals collectively provide a wide range of environmental benefits, ranging from pollination, which is vital for crop production, to natural pest control. Once you’ve implemented the above steps, your garden should be well on its way to attracting some true-blue backyard buddies. At this stage, it’s important to remember that native wildlife and household pets don’t make the best of friends. You may think your kitty couldn’t hurt a fly, but remember they are instinctively predatory. Where possible, keep cats indoors or in a secured outdoor area to avoid any late-night mischief. Similarly, it’s a good idea to keep dogs in a secured part of the backyard when outside. People like to think of their home as an oasis, retreat, or private sanctuary, and your backyard shouldn’t be any different. With a bit of careful planning and regular TLC, your outdoor area will easily become your favourite place in which to relax in the sun and admire the flourishing flora and fauna around you. 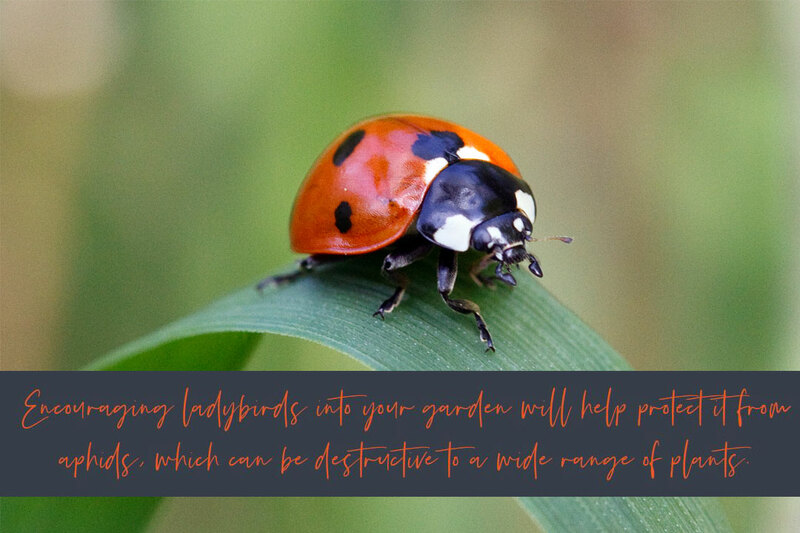 If you follow the above advice, your garden will not only become a haven for you and your family, but it will also become a little piece of paradise for our feathered, furry, web-footed and scaly friends too.